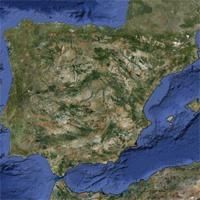 The current configuration of Spain is the result of the incredibly rich history of the Iberian Peninsula. In this sense, the largest Spanish Autonomous Community is Castille and Leon, which, along with Castille and La Mancha and Extremadura, cover more than 40% of the national territory. Andalusia also represents a huge territorial chunk of the country, and it is practically the same size as Spain's neighboring country, Portugal. On the other hand, the smallest (although very densely populated) Autonomous Communities are the Canary Islands, La Rioja, Cantabria and Basque Country. At the end of the ranking we find the autonomous cities of Ceuta and Melilla.